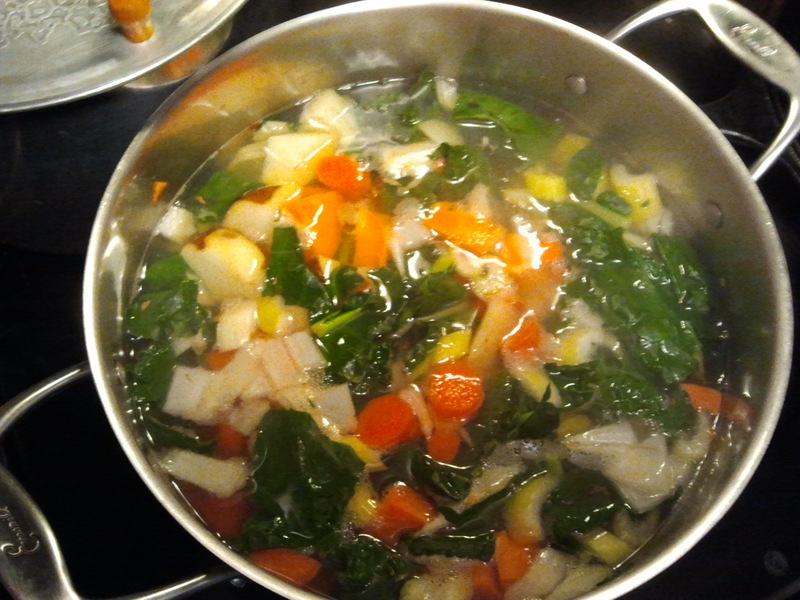 This forms the base of a really good broth. Celery and Carrots and Kale oh my! So I am three days into the Prude Papers 2013 Detox which I promise I will give all the details about in the near future. I decided that before I share the plan with others, I should have a taste of my own medicine so to speak. So I am trying it out, learning what things my body likes and what I need to tweak. To give you a sneak peek though I thought I would share some of my experiences with you. This is a 7 Day Restore and Renew Detox. Last year I did a 21 Day Candida Cleanse that was really good, but also really hard to stick with for 21 days because well..21 days is a long time, and I have never done well on simply restrictive diets, but more so on gradual lifestyle changes. So while I found the cleanse and the recipes and the overall experience quite rewarding (I lost 10lbs and kept it off for at least six-nine months, and I felt re-energized) I decided that I had to do something a little more practical in terms of time commitment and I was not looking to necessarily fight candida as I was last year, but more so to restore good eating practices, restore good bacteria and renew my commitment to my overall health and yes…wellness too. So with these goals in mind I tweaked a would be candida cleanse and focused on packing myself with as many naturally beneficial substances as possible by allowing Bentonite clay, apple fiber and antioxidant rich foods to flush out all the toxic waste inside of me. I also realized after last year’s detox that detoxifying was not only about what you ate or didn’t eat, but also slowing down, streamlining and getting back to basics if you will. So in this restore and renew detox getting enough rest, de-cluttering your heart and mind, and taking it a little more easy are just as important as what you will and won’t consume. This is definitely not one of those “do it on the go” grab a shake and eat a balanced meal plans. We can all do that, and some of us actually have, but when you force yourself just for seven days out of the whole year to slow down, to put some errands off till next week, to let your spouse or coworker or friend take over some of the things that were on your plate or to even use a sick day (don’t say I told you) so that you can sip burdock root and milk thistle tea for ten straight minutes while doing absolutely nothing else, then you are pairing the mental with the physical. Now I know not everyone has the luxury to work from home as I do, or to set their own deadlines as I do (now at least), but that is why this detox can be modified to do when you please and how you please just as long as you take your body through the three different steps that I’ll outline later. Anyway enough about all that here’s how I’m doing. Days one and two were a little difficult, I had chills, itching, dizziness, and a lot of irritability. Day two was better, not as much dizziness, not that many chills but an occasional hunger pain that was soon relieved by a scheduled detox drink. Both days I had better sleep than usual, which I wholly attribute to the nightly liver flush. It wasn’t that I actually got more sleep than usual, but the sleep I did get was better, and the dreams were quite interesting. So now Day three. I have to say I thought I would be spent by now, but I actually woke up this morning to a blanket of white snow, which meant I would have to reschedule my Wed library trip for later in the week and work from home. I rearranged my schedule and then to my surprise I worked out. I know you may be thinking “Seriously, even after 2 days on a liquid diet. Is that even safe?” Trust me I wondered if I should be lifting weights too, but I didn’t do a boot camp workout just a good light cardio workout with some Pilates, and here’s the big thing…I loved it. They say sweating is good during a detox because it is another way to aid the body in excreting toxins. Afterwards I was ready for my broth, but not drained or famished. In fact my overall energy levels have been higher throughout the day while on the detox than they have been in months (12 of them to be exact). While I have more to share on this, I will leave you now as I’m going to capitalize on all this energy and get some dissertating (dissertation writing) done! « Tomorrow is already too late. You are currently reading Detox day 3 and feeling great at The Prude Papers.